The Gravel 201 Seminar was a huge success. We had over 30 people attend! Below is a summary of what we learned that evening. 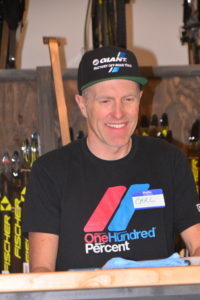 He raced professional from 1990 to 2000. He was most notably the National Road Champion in 1992 and 1997. Bart has raced road, mountain and cross. Today he is the owner of Bowen Sports Performance – a shop the specializes in coaching and bike fitting technologies. Has lived in Bend since 1981 and began racing at the age of 9. He has been a professional bike racer since 1998 (20 years) racing road, mountain, cross and gravel. 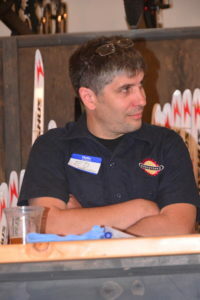 He has been with the Giant Factory Team for 16 years where he test new products and races. 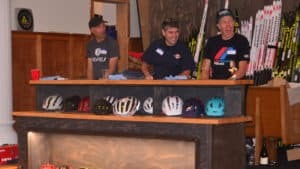 And he has won the Singlespeed World Championship, the Downieville All Mountain World Championship 5X and the Lost and Found gravel race 2X. For perspective, the Lost and Found race is 100 mile gravel race with 7000 ft of gain. Finishing in just over 5 and ½ hours. 1) Tires, Tires, Tires! This is the single most important element in making a gravel ride enjoyable or feel something like water torture. Mantra – tubeless and low pressures. Pressures need to be around 30 pounds for a 38 mm tire for a 150 pound rider. Thus, for someone like Gravel Girl, she would run 25 pound up front, 32 in back. 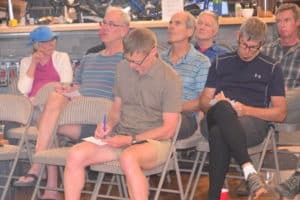 Here is a great link to Enve’s recommendations and here is a link to an very good article on tire pressure by Velo News. 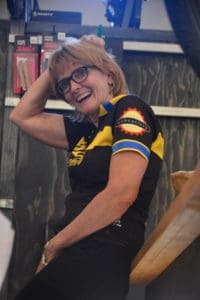 Tire pressures can and should vary from ride to ride due to trail conditions, riding speed, the mix of gravel to pavement. Go with the pressure that will provide greatest traction and / or comfort for greatest percentage of ride (i.e. gravel 90%, road 10%). 2) Finding the right bike. Demo multiple bikes if you can …. all set up the same way. 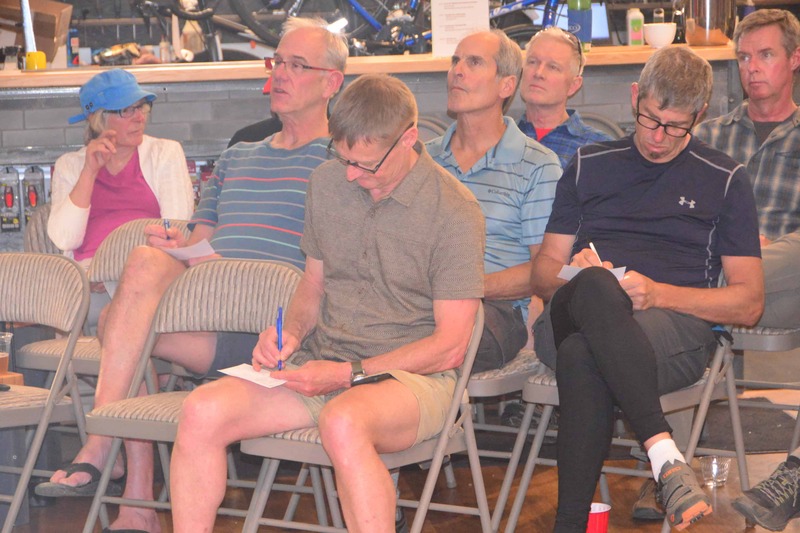 Same stem length, same crank length, same saddle, same saddle height, same tire pressure, etc. Ride the same course with each bike and on the same day if you can. Get the experts involved early on and clearly communicate your expectations of price, comfort, performance. Also, start with a fit session so that you can identify frames that fit. 3) Gearing. All 3 panelists recommended a low gearing ratio of at least 1 to 1. The is, if the front chain ring is 36 teeth, the largest rear cog must have 36 or more teeth. 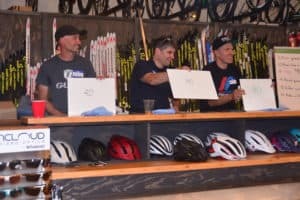 The panelists also preferred 1X chainring setups for pure gravel bikes, but if ridden on the road some time, they preferred 2X set ups. This really appeared to be personal preference. 1X set ups can be lighter, eliminate the front derailleur which is another part that can fail during a ride (rarely though), and can provide nearly the same gearing. However, a 2X system will still have a larger gearing range and have finer steps between gears. 4) Carbon frames were preferred by all 3 panelists. Carbon is light weight and each panelist desired that. However, for the recreational rider steel, titanium and aluminum are options to look at. They weigh a little bit more and are more rugged and may provide a softer ride. Some carbon frames are still really stiff …. and stiff can equal a harsh ride. 5) A light weight bike costs money. 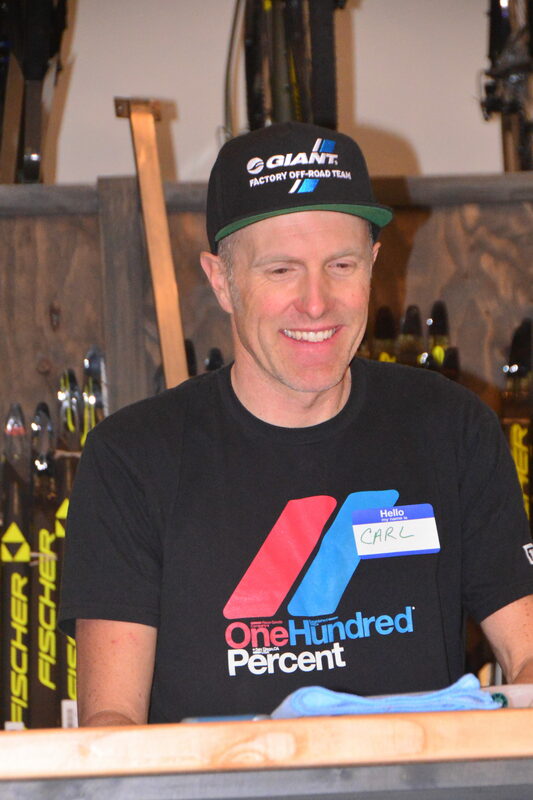 Carl Decker’s rule of thumb is that to eliminate 1 pound of bike weight it costs $1000. 6) Rims: Carbon vs. Aluminum. Yes, they all preferred carbon but it was a slight preference, not a “big deal”. And carbon rims are much more expensive. 7) Electronic shifting vs. mechanical shifting. Depends on the rider. If the rider is not very adept at shifting and trimming, electronic was preferred. But … with electronic, a failure (a cut wire, dead battery, etc.) can leave you with just one gear to ride in. 8) Mechanical breaks vs Hydraulic brakes. Big deal!! Stopping power and hand / forearm comfort are key to longer rides. Hydraulic provides that. 9) A gravel bikes is different than a road bike or a cross bike. A cross bike is meant for racing. Nimble, quick, limited gearing range, high bottom bracket. A gravel bike tends to have a longer wheel base for stability, a lower bottom bracket for stability, a wide gearing range, a fit where the riding position is a bit more upright (shorter stem length, longer head tube) and a seat height may be just a bit lower. 10) Suspensions. The jury is still out on this. However, the panelists had little to no experience riding gravel bikes with suspensions. 11) Pedals. A mountain bike clipped in pedal, like the Shimano SPD is preferred. Not a road shoe pedal. Sometimes you need to walk, and you need a shoe that you can do it in. Flat pedals may be appropriate for beginner riders. 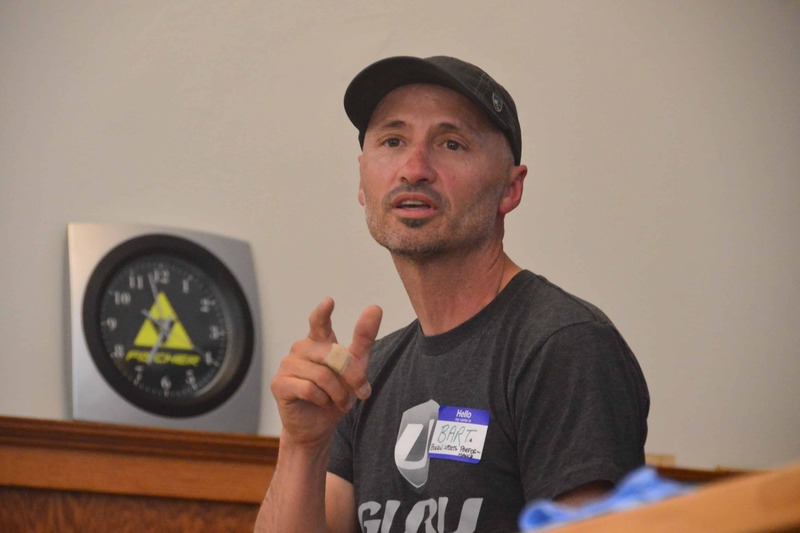 And lastly … a few comments from KevinG, the owner of Webcyclery for over 20 years and a very adept and experienced gravel rider. I think the 1x vs 2x chainring setup is somewhat moot – there are benefits to both, and I think the frame and fit are way more important – and completes are pre-packaged setups, so often won’t have the option of one vs the other (especially at the same pricepoint). For example, the Niner might come in a 1X at $3500, and a 2X at $2500 and $4500…..but if you are trying to spend X amount off dollars, you will probably have limited options. The $1000/lb rule is pretty standard – and is usually used to describe losing the weight after you have the bike. So if Gravel Girl wants to take another pound off the bike, odds are it will cost $1000. But that doesn’t mean the a $3000 bike is a pound lighter than a $2000 bike. Brakes – yes, hydraulic are way better….but again, that was coming from racers who all have $4000+ bikes. If someone wants a bike for $1000, odds are they might get mechanicals…..most people also aren’t braking the way those guys do. Suspension – I think they all agreed that the desired suspension setup is not your standard MTB suspension – it needs have high frequency bump compliance – the Lauf might be one of the best bets. And I agree with Eric – tire volume and pressure is the first step to a more comfortable ride. Great series. Thank you for all of the ground work you have done.